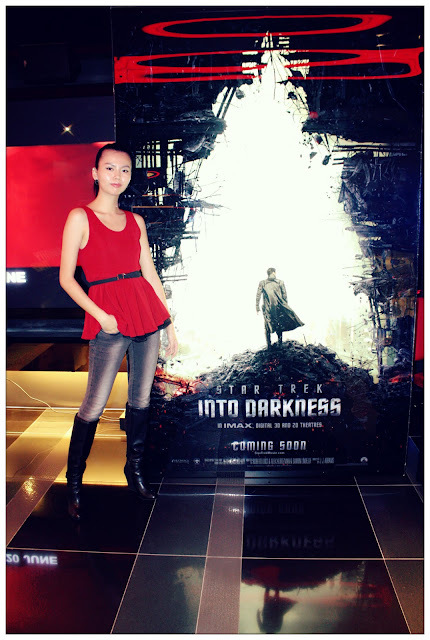 I am not a geek, I don't really into sci-fi movies BUT Star Trek: Into Darkness totally changed my perception towards Star Trek and triggered my interest towards it. Thank you TGV cinemas and Tammy who invited me to the premiere of Star Trek: Into Darkness 3D, I get to experienced the most intense, awesome supersonic galactic movie watching experience. 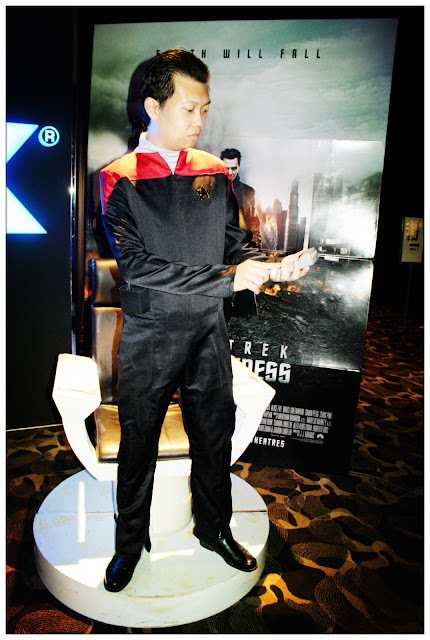 And did I tell you that Kuala Lumpur Star Trek Fans Club did dressed up and cosplay for this premiere? They're so cool can!!! 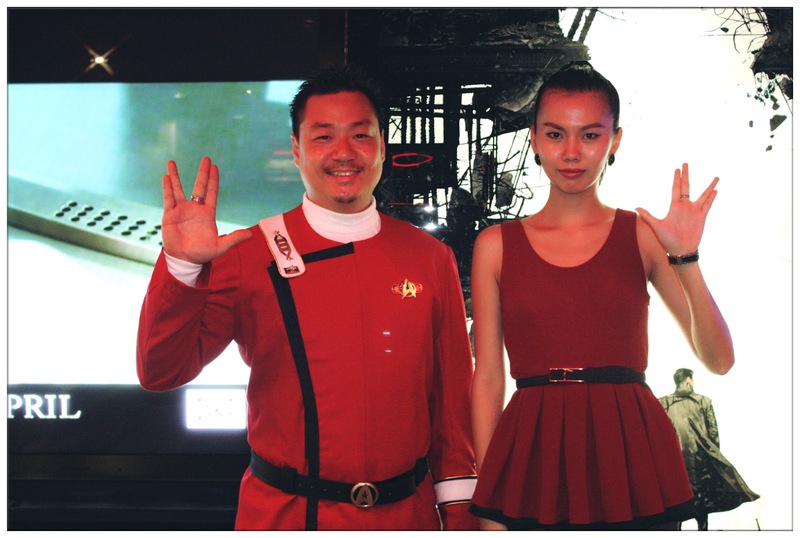 Some of the Trekkies that dressed-up as Star Trek characters. I really wonder where they get those Star Trek uniform. I've been thinking of what to wear, since it's a premiere and I was told that there will be a cosplay session. 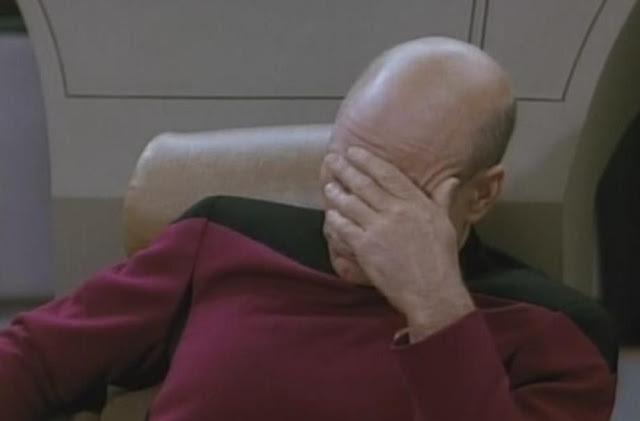 I wanted to wear something resembles Star Trek but I have none, and so I wear the top I borrow from my friend and pair it with skinny jeans and a pair of boots which I just bought at Forever21 one day before the premiere. 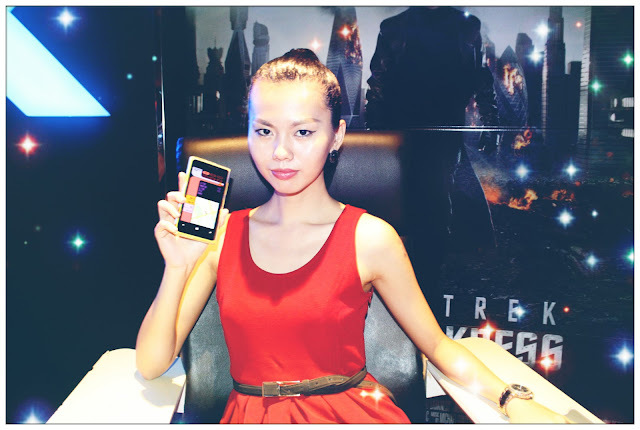 Then voila, I am a part of the Star Trek team hahaha. Luckily Tammy was there to help me take photos with the cosplayers. Thank you sweetie. Everybody wants to be Captain. 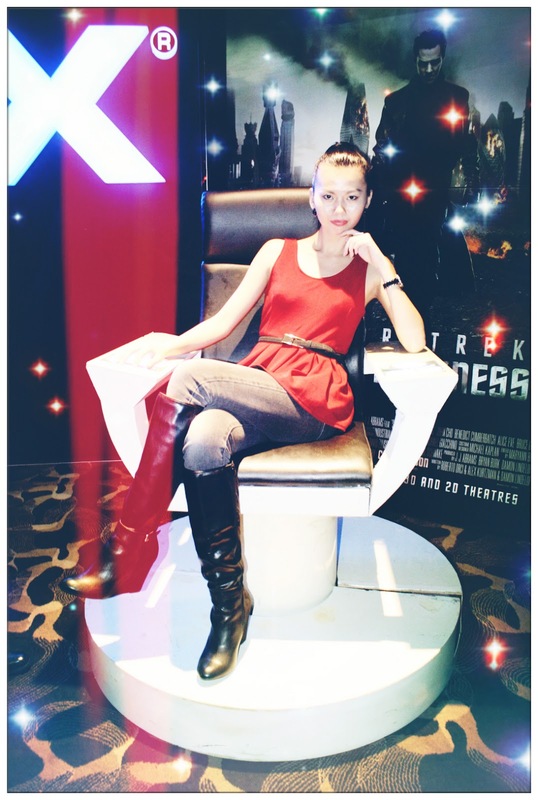 If you visit TGV Cinemas at One Utama, you will find that there are one captain chair. Everybody loves captain chair, and wants to sit on the captain chair. 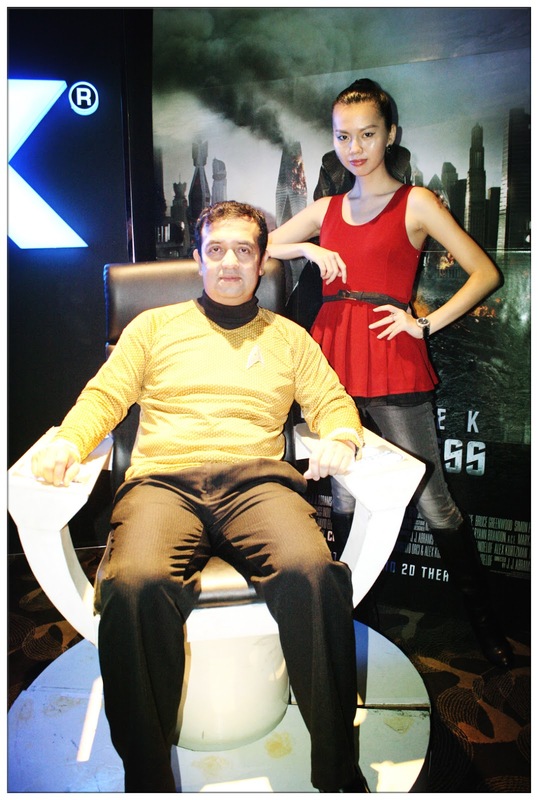 I had my taste of being a Star Trek Captain for few minutes, you should to. They take cosplay into serious matter, props are a MUST! Ready to explore to the galaxy, to places where no man has gone. Wow I get a communicator device to post with!!! Trekkies are one of the friendliest cosplayer and fans I have ever encountered. 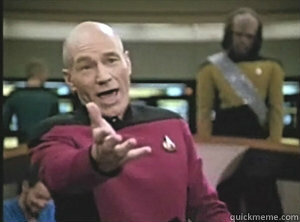 They keep on giving me communicator and devices to post with. Hahaha. Although I know mostly guys are camera shy but that day they are so brave they posed in front of the cameras for so long, all because of the love they have for Star Trek! Kudos to them. This is my first time watching IMAX 3D of the movie and I must say: YOU HAVE TO WATCH THIS MOVIE IN IMAX 3D!!! The visual-effect is so stunning it will blow you away. Have you think of how it feels to live in the future? Where can travel from planet to planet and space warp here and there? 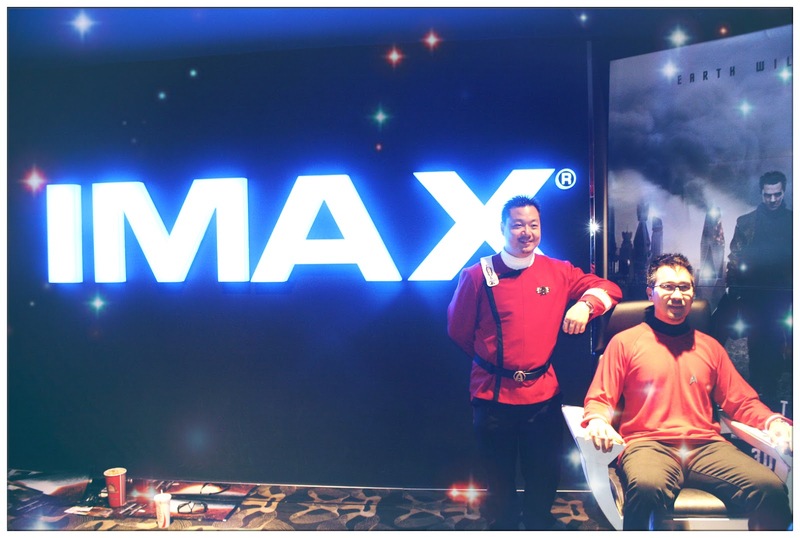 IMAX 3D pretty much give you a very real and convincing experience that I literally lost myself in space. It's like living in year 2259. The characters face feature is so surreal as if they're acting in front of us, as if I can touch them if I reach out my hands, what can be more exciting than a movie-watching experience as awesome as this? ONLY available in TGV IMAX 3D I tell ya! Plus we get pretty movie posters and one is glow in the dark type! Woohoo. Thank you to TGV Cinemas and Tammy again for this awesome and unique movie viewing experience. 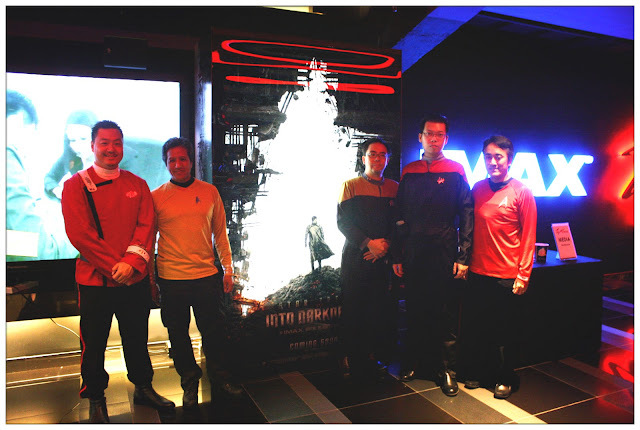 Don't forget to catch Star Trek: Into Darkness at TGV IMAX cinema starting this weel. It totally worth every cent spent!!! I guess I can't wait to be Captain of USS Enterprise. Ooh yeah~ Captain chair is so comfortable!! !